The Z Hotel Zanzibar, The Z Beach Hotel Zanzibar, North Coast Beach Resorts, Zanzibar North Coast Hotels, The Z Beah Resort :-A guide to accommodation in Zanzibar inclusive of hotels in Zanzibar Stone Town, East coast Beach hotels, South coast Beach Resorts, North East Coast Hotels and activities diving and snorkeling, dhow and dolphin safaris, wind surfing, deep sea fishing. This chic, boutique hotel situated in a secluded plot on the corner of an idyllic beach in Nungwi, is located on the northern tip of Zanzibar. It blends elegant, contemporary design with traditional Zanzibari features to create a unique cool and relaxing environment. Set in a lush, tropical garden with direct access to the white powder beaches and warm waters of the Indian Ocean, The Z hotel Zanzibar has been finished to a high specification by an international team of architects and interior designers: each room has floor to ceiling glass doors leading onto a balcony which looks out across the Ocean. All rooms feature LCD TVs, DSTV cable television, WiFi and Philippe Starck furniture. The hotel offers alfresco dining in our main restaurant �Saruche�, along with Asian-fusion tapas and sharing platters in �Cinnamon�, our cocktail bar, where you can also find our exclusive list of mouth watering cocktails. 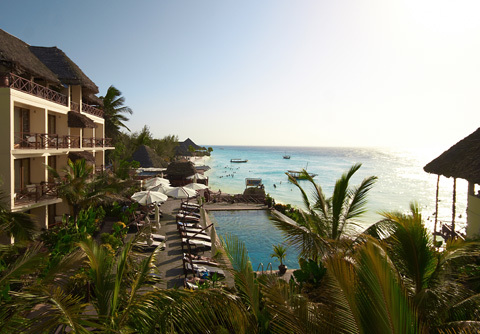 The Z Hotel is rated number 1 hotel in Nungwi, Zanzibar. There are 6 room designs: Deluxe Garden View, Deluxe Sea View, Interconnecting Rooms, Roof-Top Suites, Ocean Front Cottages with private decks over the sea and for the ultimate in opulence, there�s our 70 sq metre Z Suite with 2 terraces and an outdoor jacuzzi. The Z Hotel�s Saruche Restaurant offers a four course Table de Hote Menu of African-European fusion cuisine as well as a variety of fresh-from-the-ocean fish and seafood. The restaurant has a sophisticated, yet relaxed atmosphere where you can sample some of the finest cuisine Zanzibar has to offer and taste fine wines from our international wine selection. Other than sampling our delicious four course Table de Hote Menu, The Z Hotel also offer themed buffet evenings on select nights. 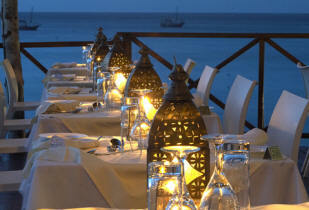 Ranging from the Seafood Fiesta to Traditional African style meals, all accompanied by live entertainment. With stunning views across the ocean, Saruche restaurant rests on the edge of a small cliff where you can eat al fresco on a deck over the ocean with only the rippling tide to keep you company. The Z's Cinnamon is a vibrant, 1st floor, open bar where you can quench your thirst with an ice cold beer on a lazy, sun-baked afternoon or sample an aperitif from our extensive Champagne and cocktail menu. Cinnamon is located on what is recognized as the best place on the Island to view the magnificent Zanzibari sunset, relax and enjoy the atmosphere�with a cocktail in hand of course! If you�re looking for something special, we can also section off areas of the bar for private parties or a more intimate evening. The Cinnamon menu offers Asian fusion tapas and sharing platters, as well as simple classics like Fish & Chips, continental salads and Sushi. For the energetic traveller there are numerous activities available at the Z Hotel. Zanzibar�s warm turquoise waters and stunning coral reefs offer the perfect haven for divers and deep sea fishing enthusiasts. The Z Hotel recommends the most professional and fully equipped local Dive Centre, located close to the hotel, whose experienced and safety conscience team will reassure the novice and challenge the more experienced diver. Whether its snorkeling amongst the rich marine life that inhabit the coral reefs, or swimming with the Humpback whales during their migration The Z Hotel can assist you with all your diving needs. Excursions to Stonetown and throughout Zanzibar are also available with a wealth of history waiting to be discovered. Much of this can be found in the Island�s capital, Stonetown. Guests wishing to explore more of the Island will find an array of excursions on offer including visits to Jozani Forest � home to the endangered Red Colobus Monkey, Spice Tours, Prison Island Excursion and Mnarani Turtle Sanctuary. Relaxing by the pool with a cocktail, deep sea fishing or exploring Zanzibar�s history, which ever you chose you are assured an exciting variety of activity at The Z Hotel. 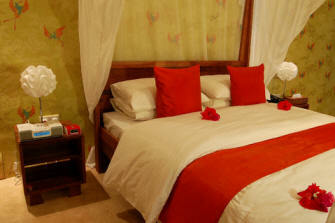 The Z Hotel Zanzibar can be hired out for corporate functions and team-building events. There are 3 spaces available: exclusive use of the Saruche Restaurant space can be arranged for larger meetings; for more informal occasions, Cinnamon Cocktail Bar is available with its ocean views, and for more intimate gatherings theres our reading room. In addition, the hotel can arrange team-building events and excursions which can be tailor-made to your requirements. Please visit our Activities pages for further information. The Z Hotel Zanzibar offers a full wedding and honeymoon service through a wedding coordinator, who can arrange a truly unique, customized wedding which caters for your every need. Here are some ideas to get you dreaming of your big day . . . The Z Hotel Zanzibar can offer pre-wedding champagne in their tropical garden, followed by a full wedding ceremony on our white powder beach. The Z Hotel are happy to accommodate any special catering requirements you may have in the Saruche Restaurant personally overseen by the Head Chef, followed by a reception on first floor Cinnamon Cocktail Bar. Alternatively, you can exchange your vows on a local Dhow, as you sail across the horizon during the stunning Zanzibar sunset, followed by a Wedding breakfast at the beach and reception in our Cinnamon Cocktail Bar.